Sunde White Industries|See's Candies Do's and Dont's! 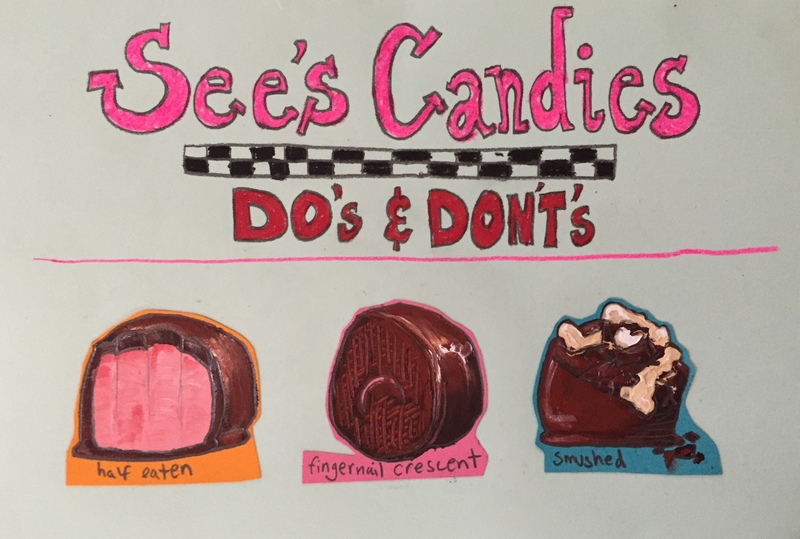 See’s Candies Do’s and Dont’s! See’s Candy is a glorious holiday mystery. It’s easy to identify your favorites but what about the pieces that you aren’t as familiar with? People have a lot of identification strategies but I disapprove of all of them. Here are my do’s and dont’s. When it comes to See’s Candy you have to take responsibility for your choices. When you get a bad one you do not get to put it back in the box with a bite out of it. Politely offer the rest to a loved one dear enough to you to share spit with or throw it away. Don’t let it sit there drying out, half eaten until February. Don’t be like a certain sister I have that used to covertly identify See’s Candy by burrowing her fingernail into the bottom of each piece, leaving behind tiny crescents in the bottom of all the pieces. This is gross, do not do this! Do not “accidentally” smush the tops of each piece in order to expose the fillings. No one believes that your hand accidentally fell down on top of half a box of chocolates. Is there a solution to this identification conundrum? Yes! Custom boxes! By now you probably know all of your and your loved one’s favorite chocolates. Do go down to the See’s shop and fill up your boxes with everybody’s favorites, freeing us from See’s candy bad manners forever!